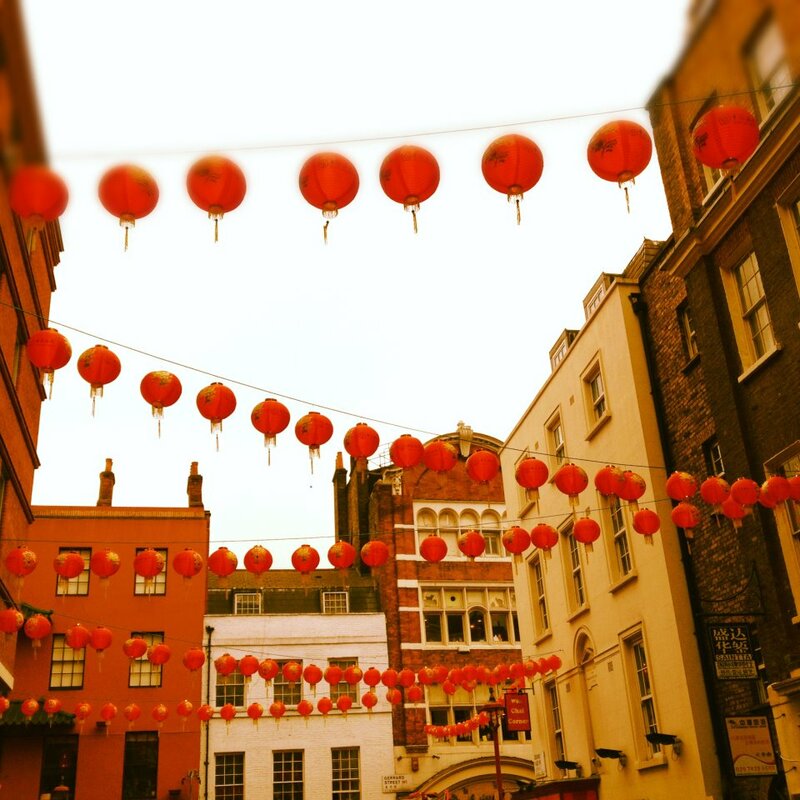 With ear muffs, hats, gloves, scarves and several layers, I headed out to join the celebrations for Chinese New Year this Sunday in London’s Trafalgar Square and Chinatown. After a couple of hours squeezing down colourful streets crammed with excited children bringing paper dragons to life and hungry grown-ups hunting out the best dim sum, I moved on to take in some of the dancing and music in Trafalgar Square. By 4pm, we found ourselves faced with a dilemma; do we wait a couple of hours in the cold to see what seemed certain to be a fabulous fireworks display, or do we head home and potentially miss out? We decided to grab a (very large) hot chocolate, find ourselves a spot on some (very cold) stone steps and wait it out. That turned out not to be such a great idea; firstly, the fireworks felt distinctly disappointing. There was something of a cumulative ‘is that it? !’ as they came to an end the huge crowds dispersed. Secondly, we were freezing – ear muffs and all. So it’s safe to say that by the time we got home, getting warm was top of our list, and I had just the thing for it; stew. There’s nothing quite like a bowl full of steaming hot, flavoursome stew on a cold winter’s night to warm from within. But after a day being wrapped up in divinely exotic smells from all corners of the world, I knew we needed something with a little zing to it. With a little experimentation, this was the fabulous, sweet, rich and spicy result. 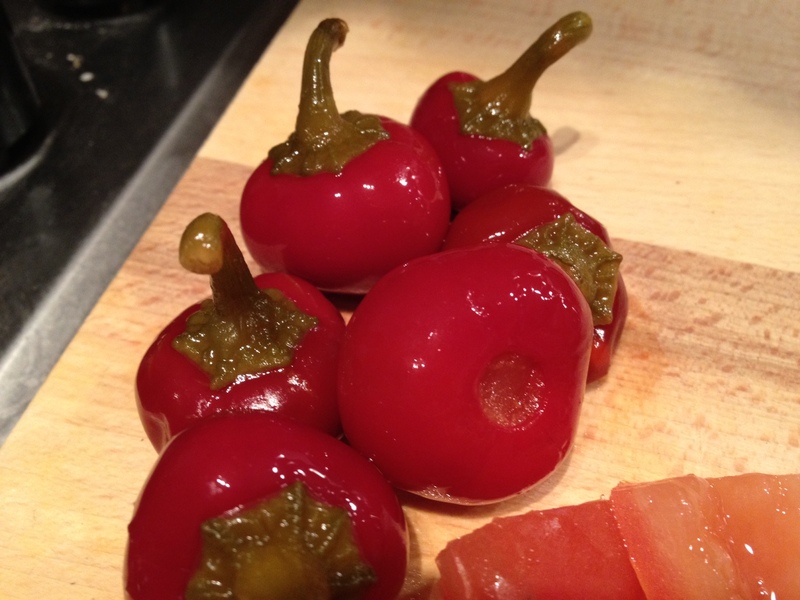 These tiny, beautifully sweet and zingy peppers are a fantastic store cupboard ingredient, and will perk up any dish. I actually picked up a huge jar in our local 99p store, but you can grab them in most supermarkets, too. The great thing about this one is that although it’s hearty and filling, it actually contains at least four of your five a day. Whack a little butternut squash in there if you fancy and there’s your five! Serves 2-3 but is easily doubled. 4 medium tomatoes, chopped into chunks. In a medium saucepan, heat the olive oil and add the onions. Cook for 3-4 minutes until softened, before adding the garlic and chorizo. Cook for a further 5 minutes until the chorizo oil has nicely coloured the onions. Add the pepper and courgette to the pan and cook for another couple of minutes. Throw in the tomatoes (chopped and fresh), add the herbs and spices, and season generously with salt and black pepper. Fill up the tomato tin halfway with water and add that to the pan. Simmer for a couple of minutes, before transferring to a casserole dish and popping in the oven for 30 minutes. While the stew is bubbling away, get on with making your dumplings. Add the flour, grated suet and cheese to a bowl and rub together. Gradually add the water until the mixture comes together easily. Form the mixture into six balls by rolling in the palms of your hands. When the stew has been in the oven for 30 minutes, take off the lid, pop in the dumplings, and return to the oven without the lid, turning the oven up to 200 degrees, for 20 minutes. It’s hearty enough to serve on its own, but it’d be great with a hunk of fresh bread or spicy rice, too. 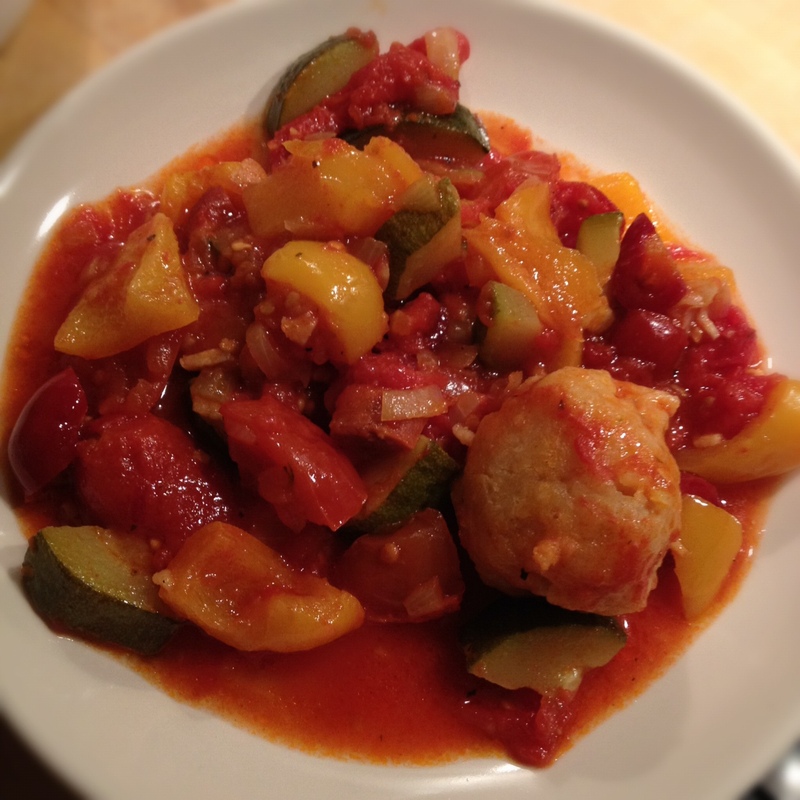 The chorizo and sweet pepper recipe looks delicious. I love both of those things! Smoked paprika can add such a nce depth of flavor to dishes. Can’t wait to try it! yum yum yum! I was at the strand on Sunday watching the dragons dancing. so cold!! we ended up at wagamamas for a big bowl of ramen to warm up before 6 hours on the megabus home 🙂 your stew looks delicious. bet its perfect comfort.food! This looks like the type of stew that needs to be in my tum. I may try it out later in the week.